Ghosts, ghouls, and goblins lurk in the dark during Halloween. 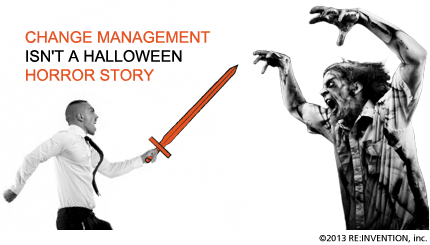 Change management can be equally frightening. This month's RE:INVENTION Report shares tips and tools to help you overcome your company's fear of change and other spooky monsters. THIS MONTH'S "MUST READ THREE"
1. Too petrified to take the first step? Our team discusses gear-shifting strategies in Coasting vs. Risk-Taking, a Friday 5x5 Feature. 2. Terrified by technology? RE:INVENTION shares fearless resource optimization tips in Business 2 Community's recent article. 3. Don't let new digital tools scare you. Booz & Company's 2013 Global Innovation 1000 Study explains how smart companies use immersion labs, rapid prototyping, market intelligence tools, and enhanced product life-cycle management systems to decrease risk and increase innovation. Watch our new video showcasing RE:INVENTION Client success stories. Don't let your next product or service launch turn into a blood-curdling nightmare. Join RE:INVENTION and KCD PR for our November 13 webinar, "Driving Successful Product and Service Launches in the Financial Services Industry". REGISTER NOW. RE:INVENTION's Expert Series features inspirational stories from business leaders who confronted spine-chilling obstacles and sparked transformation. Up this month: an interview with Jake Nickell, co-founder and CEO of Threadless. • Dreading change? RE:INVENTION team member, Dennis Jarvis, shares 8 fear-mastery tips. • K-9 Intern Kane Dawg faced hair-raising demons when RE:INVENTION's team recently changed his dog food brand. Check out his four barktastic change management tips. RE:INVENTION is honored to be a 2013 iMedia Agency Awards finalist in TWO categories: Best Agency for Performance Marketing and Best Agency for Video. We're up against industry giants. Scaaarry! Help us win by casting YOUR VOTE. For over a decade, RE:INVENTION, an innovation consulting firm, has jump-started growth and created a culture of transformation for 60+ clients, from Fortune 500 leaders to Inc. 5000 startups. We're change agents who have helped companies invent and launch over 40 new products and ventures and reinvent underperforming brands.